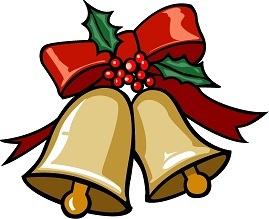 'Tis the season to be jolly... and what could be more fun than Christmas party activities? Use the following ideas to plan a fun party or use several ideas during the month of December for a fun-filled holiday season. This is the time of year when children are so excited about the upcoming holiday. That makes it a good time to take a break from the usual activities and do something a little different. Check out the activities below for ideas that will allow the kids to be excited about the upcoming holiday while enjoying a Christmas activity. All of the following activities have been kid-tested and approved! Play a variation of Simon says. Wear a Santa Hat for extra fun. Place a couple of hula hoops a set distance away and have a snowball throwing contest. Not enough snow? Play indoors with crumpled paper. Give each child the sheet of pictures. Have them cut them out and paste in any order they choose on the bingo board. For younger children, give them pre-cut pictures. Do not cover up the free space. Each child will have one leftover picture. Once the pictures are secure on the boards, you’re ready to play. Make a separate set of pictures for the bingo caller. Use whatever you have on hand for markers, or for holiday fun… use green and red M & M’s. Simply click on the game below to print. 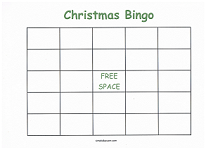 This is one of those Christmas party activities that really holds children's attention. Well, that and, kids just really like Bingo! Make some simple sugar cookies in advance of the party. Set out frosting, small candies and sprinkles and let the kids decorate their own cookies. Wrap a present with several layers of paper. Have the children sit in a circle and start the music. Have the children pass the present around the circle until the music stops. The child holding the present will remove one layer of paper. Start the music again and continue until several children have removed a layer of paper. When the last layer of paper is removed, have the box contain a treat all of the children can share. This Christmas party activity will quiet things down a bit. Have all the kids lay around on the floor pretending they are elves after Christmas. They are so tired from making all those toys. The object is to not move or make a sound. You will, however, walk around the room (no touching allowed) and talk to the elves. Try to make them squirm or giggle. Once they move, they become your helpers and will try to get others to move. The last un-moving elf is the winner. All you need for this activity is a pillowcase and enough toys to almost fill it. Make sure there is an assortment of different sized toys. Divide the children into groups of two. Dump the toys from the pillowcase onto the floor, say GO! and give each team a turn to see who can fill Santa’s sack the fastest. 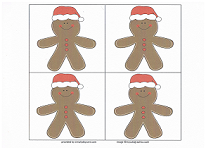 Can you have Christmas party activities without gingerbread men? Here's a simple way to include them. 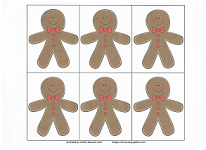 Make copies of the gingerbread sheets. 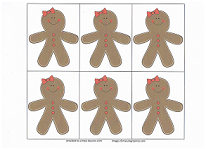 There is one sheet of gingerbread boys, one sheet of gingerbread girls and a sheet with gingerbread men wearing a Santa hat. Make as many copies as you like, depending on how many you would like to hide. With a roll of scotch tape, they can be hidden anywhere. Under tables, the backs of chairs, behind doors, etc. Make sure that some of the gingerbread people can be easily seen. Set a timer and let the children go hunting. Scoring is simple. One point for a gingerbread boy or girl. Two points if you find one wearing a Santa hat. The player with the most points wins. Live in an area where there is plenty of snow? Then this is a must when planning your Christmas party activities! Bundle up in winter gear and have a snowman building contest. Give each team the snowman essentials... hat, scarf, two sticks for arms, materials for eyes and mouth and a carrot for the nose. Sound a buzzer and see which team can complete a snowman the fastest. Warm up with hot chocolate afterwards! Prior to the party cut Christmas tree or wreath shapes out of green card stock paper. Make sure you have one for each guest. Spread newspaper over the table and provide glue, craft sequins, glitter, buttons, tiny pom poms, etc. Securely tape a large sheet of paper to cover one wall at least three feet from the floor. 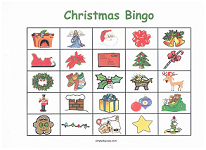 Pass out washable markers and crayons and encourage the children to draw a Christmas scene. This is a great way to start your Christmas party activities, as it gives you extra time to set up upcoming activities or gives some children an activity right away while you are waiting for more guests to arrive. OR... cover the table with a plain white tablecloth (make sure it is secured to the table), place crayons on the table and let the kids create their own Christmas tablecloth. Visit the FREE PRINTABLES section to make planning daycare activities incredibly simple.